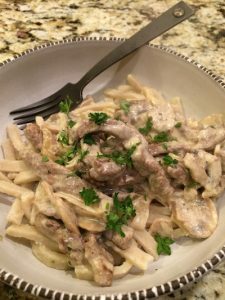 Beef Stroganoff – Damn Life is Good! I’m a sucker for carbs. And beef. And rich, creamy sauces. This simple but delish dish combines them all. It is super easy and quick to make on a weeknight but is fancy enough to serve at a casual dinner party. Melt 3 T of butter in a large skillet. Add onion and season with salt and pepper. Cook onion for about 2-3 minutes then add the mushrooms. Continue cooking until both are browned and tender. Off heat, add the Cognac. Cook over high heat until evaporated, about 10 seconds. Add the stock and boil until nearly evaporated, about 5 minutes. Stir in the sour cream and mustard and simmer until thickened about 5 minutes. In another skillet, melt remaining 1 T butter. Season meat with salt and pepper and add to hot skillet. Cook on high, turning once, until browned in some spots but still rare, about 2 minutes. Scrape the meat and any juices into the mushroom and onion sauce and simmer until heated through, about 1 minutes. Serve over egg noodles and top with parsley if desired. pro tip: if there are lots of yummy brown bits still in the pan, deglaze with a few tablespoons of white wine and pour into the main meat, mushroom and sauce pan. Try this delicious, comfort dish with a lively Italian red such as Montepulciano D’Abruzzio.